Stone Plum collection, ring sling fabric piece, #1. 10/2 mercerized cotton warp. Weft: 10/2 mercerized cotton. Glitter in warp. Pebble weave pattern. 260 GSM. 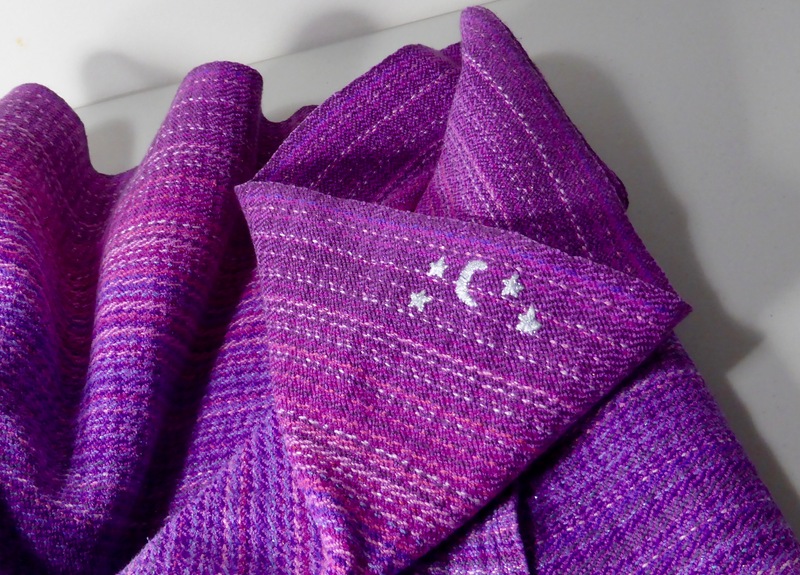 Stone Plum collection, wrap #2. 10/2 mercerized cotton warp. Weft: 10/2 mercerized cotton, with tail accent in different colours. Hand-embroidered middle markers. Pebble weave pattern. 260 GSM. Stone Plum collection, wrap #3. 10/2 mercerized cotton warp. Weft: 8/2 cottolin in Royal colour. Hand-embroidered middle markers. Waves weave pattern. 348 GSM. Stone Plum collection, wrap #4. 10/2 mercerized cotton warp. Weft: Alpaca / silk in Navy colour. Hand-embroidered middle markers. Waves weave pattern. 300 GSM. Stone Plum collection, wrap #5. 10/2 mercerized cotton warp. 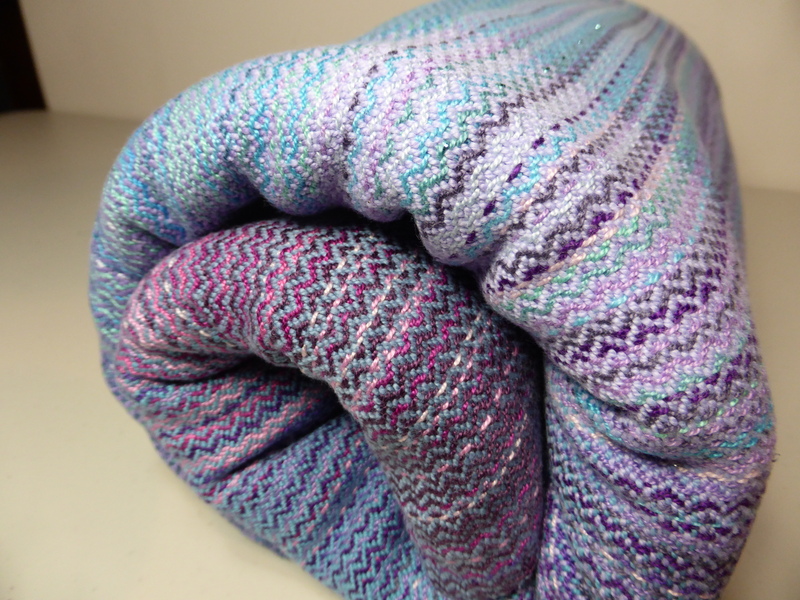 Weft: hand-dyed SeaSilk, “Frozen Ocean” by the HandMaiden. Hand-embroidered middle markers. Waves weave pattern. 300 GSM. Stone Plum collection, wrap #6. 10/2 mercerized cotton warp. Weft: 8/2 variegated cotton “Wild Grape”. Hand-embroidered middle marker. 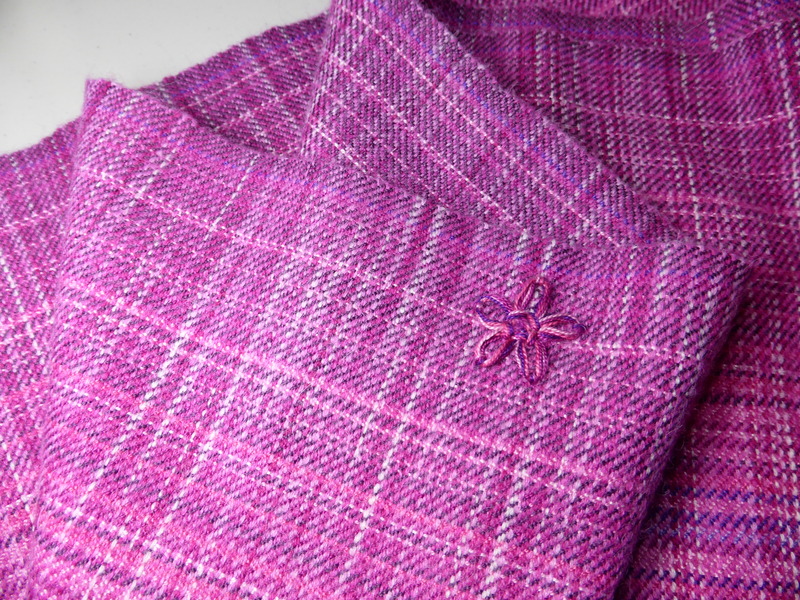 Vertical pointed twill weave pattern. 320 GSM. 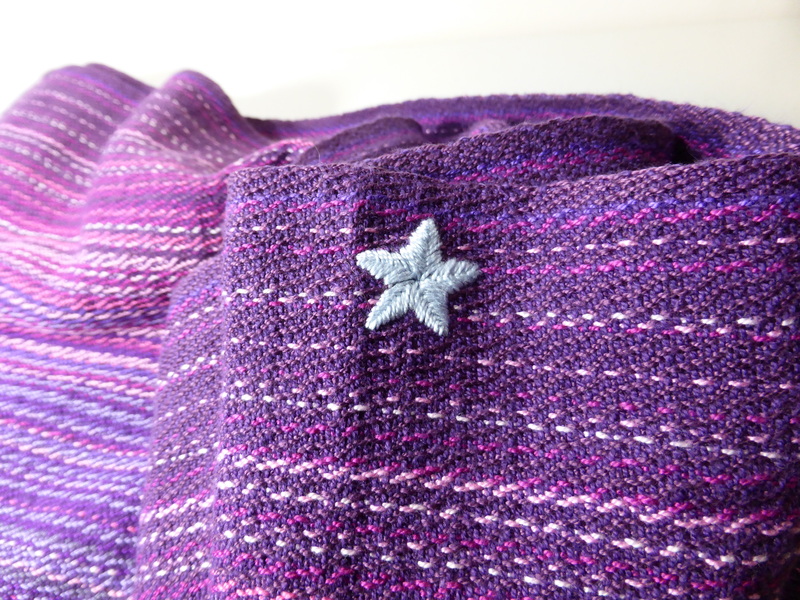 Stone Plum collection, ring sling fabric piece, #7. 10/2 mercerized cotton warp. 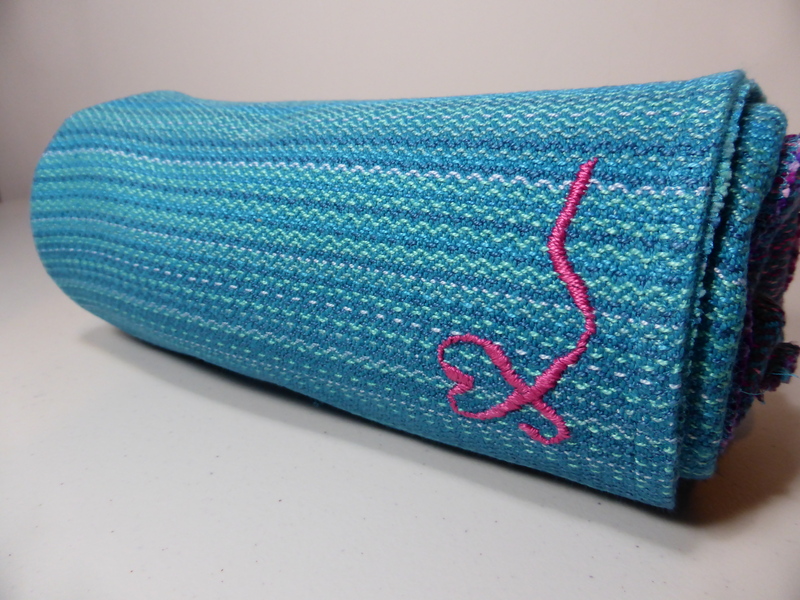 Weft: 8/2 mercerized cotton. Hand-embroidered middle markers.Vertical pointed twill weave pattern. 315 GSM. 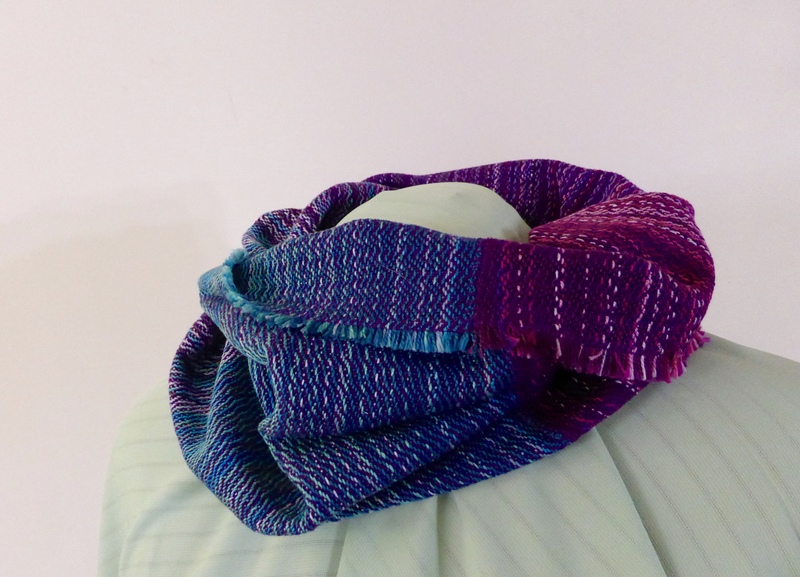 Stone Plum collection, wrap #8. 10/2 mercerized cotton warp. 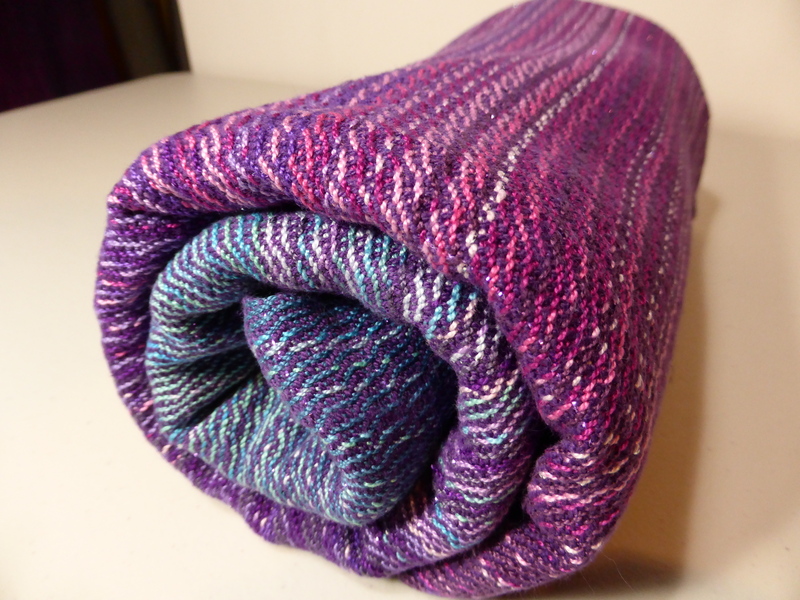 Weft: purple bourette silk. Hand-embroidered middle marker. Waves weave pattern. 350 GSM. 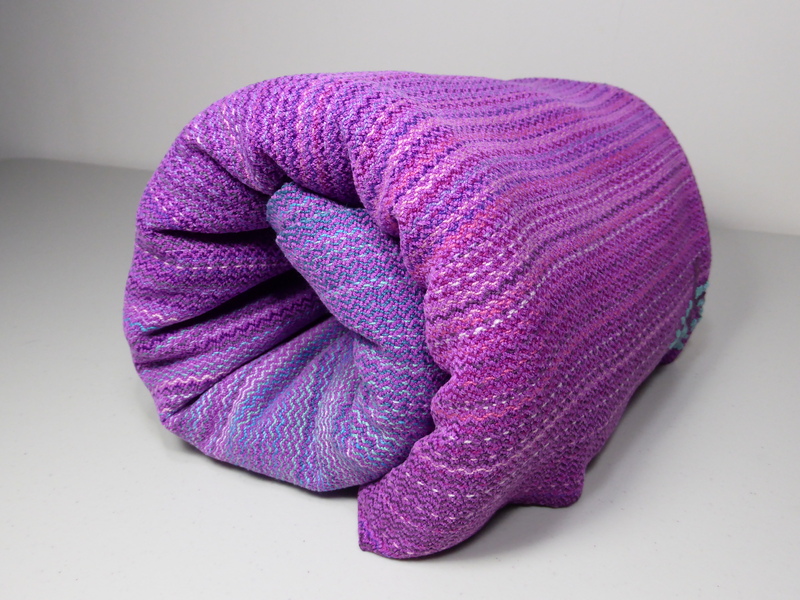 Stone Plum collection, wrap #9. 10/2 mercerized cotton warp. 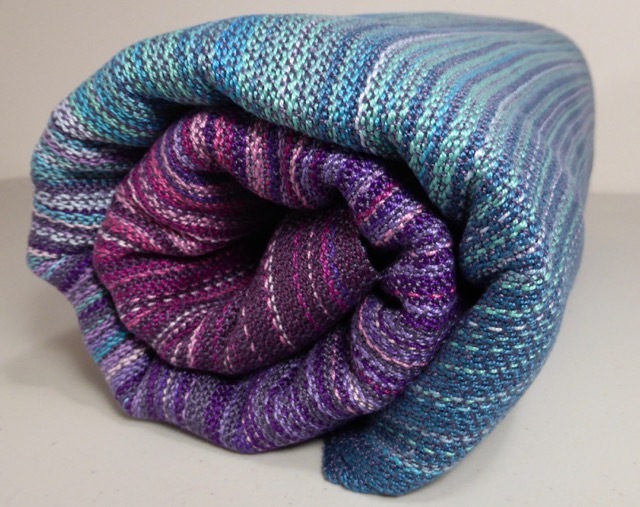 Weft: variegated bourette silk. Hand-embroidered middle marker. Waves weave pattern. 330 GSM. 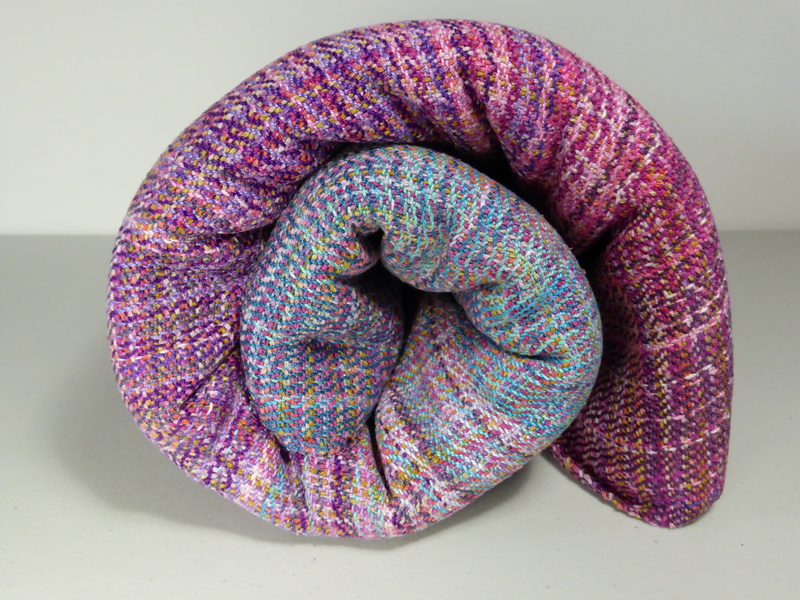 Stone Plum collection, ring sling fabric piece, #10. 10/2 mercerized cotton warp. Weft: 8/2 purple cottolin. Waves weave pattern. 340 GSM. Stone Plum collection, fabric piece, #11. 10/2 mercerized cotton warp. Weft: 10/2 mercerized cotton in Nassau. Scallops weave pattern. 320 GSM. Stone Plum collection,wrap #12. 10/2 mercerized cotton warp. 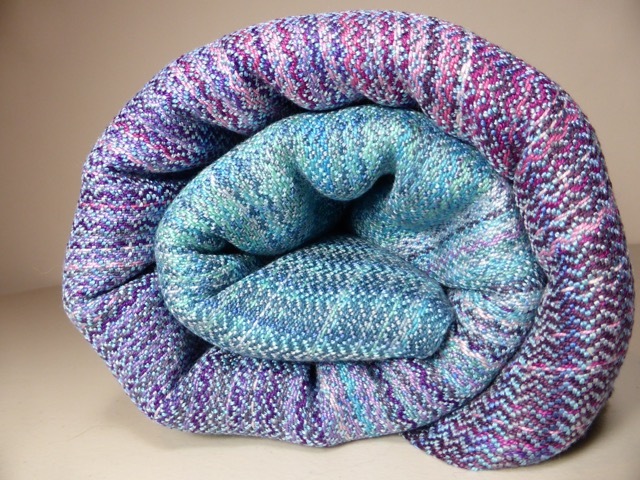 Weft: Mulberry spun silk, hand-dyed. Waves weave pattern. 420 GSM. Stone Plum collection,wrap #13. 10/2 mercerized cotton warp. 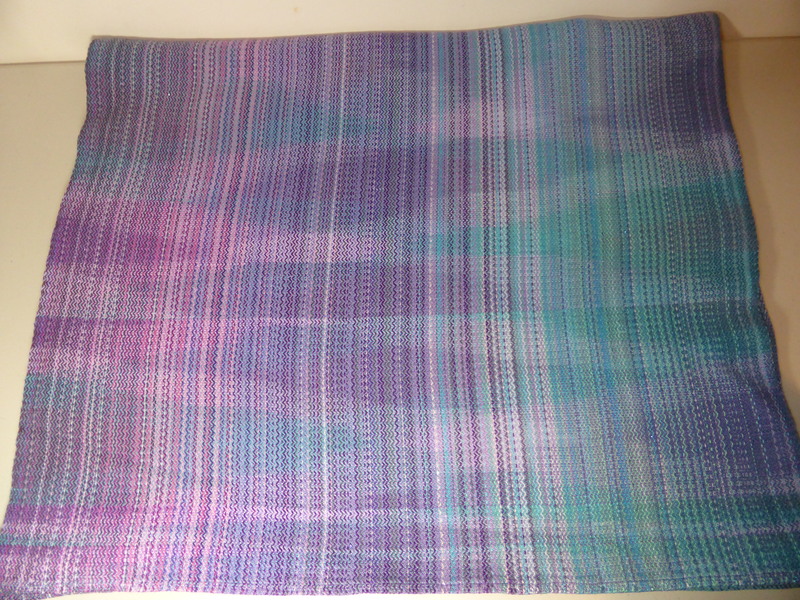 Weft: Alpaca and silk, hand-dyed. Swiss twill weave pattern. 335 GSM. Stone Plum collection,wrap #14. 10/2 mercerized cotton warp. Weft: purple cottolin. Waves weave pattern. 335 GSM. Stone Plum collection, ring sling fabric #15. 10/2 mercerized cotton warp. 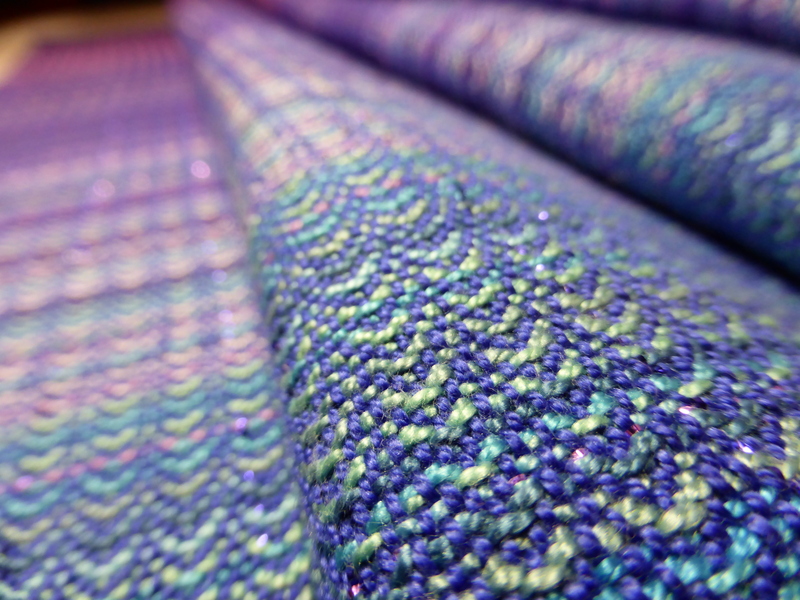 Weft: Peacock cottolin. Vertical twill weave pattern. 335 GSM. Stone Plum collection, wrap #16. 10/2 mercerized cotton warp. 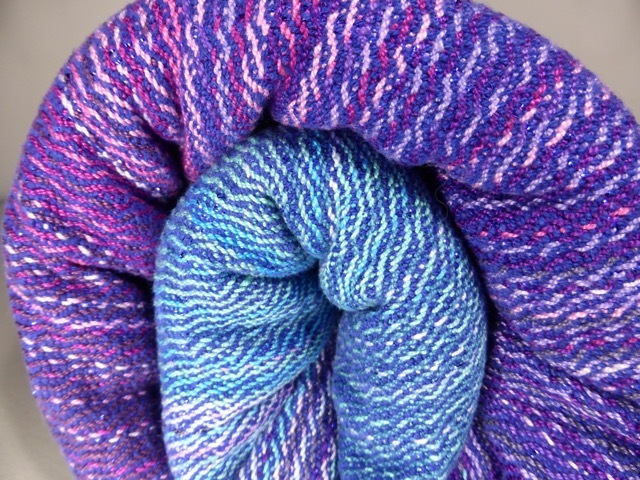 Weft: Mulberry spun silk, hand-dyed. Vertical twill weave pattern. 390 GSM. Stone Plum collection, piece #17. 10/2 mercerized cotton warp. 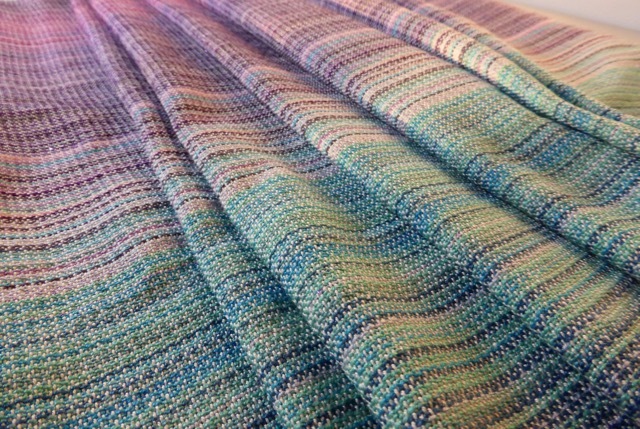 Weft: mercerized cotton. Waves weave pattern. And yes, it is a scarf! 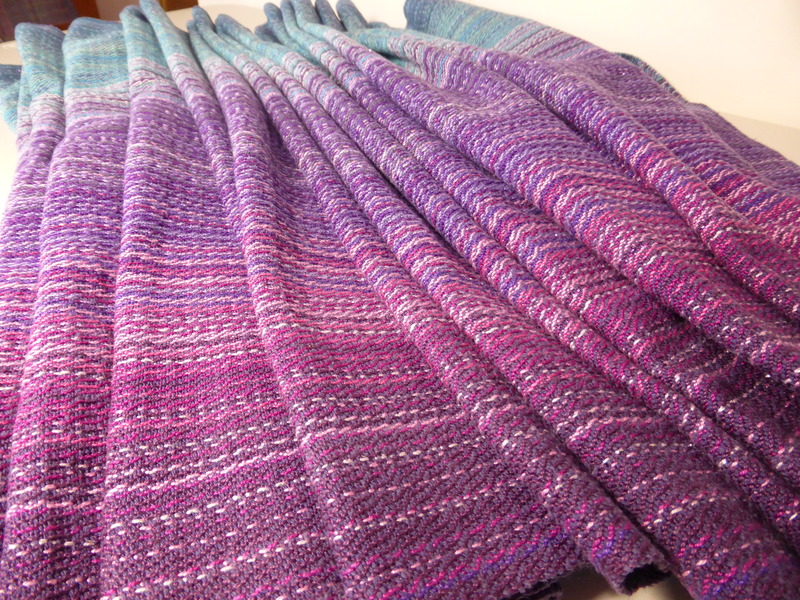 Stone Plum collection, piece #18, a shawl. 10/2 mercerized cotton warp. 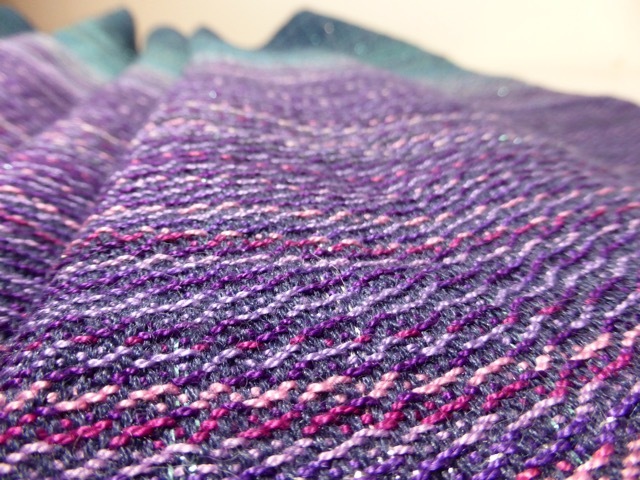 Weft: Mulberry spun silk. Vertical twill weave pattern.